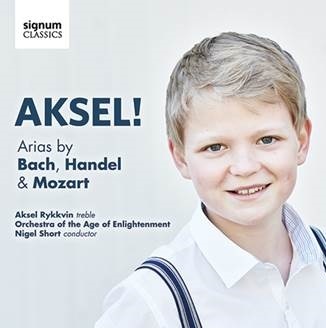 Boy soprano Aksel Rykkvin has received terrific reviews for his first solo album with Signum Records, accompanied by the Orchestra of the Age of Enlightenment and conducted by Tenebrae Artistic Director, Nigel Short. The disc, Aksel! Arias by Bach, Handel and Mozart, has gone from strength to strength, with Gramophone describing Aksel as “so much more than a treble, a boy soprano: he is a singer” whilst Classical Source commented that Aksel is “lauded by critics and audiences alike for his unusually rich and mature voice, skilful virtuosity and innate musciality”. We are thrilled for Aksel’s success and look forward to what his next releases will bring!